Last winter I attended the Heimtextil show in Frankfurt. It's the world’s main trade show for all home textiles and wallcoverings. It’s astoundingly massive and full of delicious inspiration. My favourite hall was the one with all the vendors from India and their spectacular handcrafted products: block print and screen print textiles, handwoven carpets, throws, bedding. But here’s the thing: in no way do I equate my little project with these amazing goods. I’m not trying to rip off their designs I am just inspired by the palette and technique. I just wanted to give it a shot. There appear to be a lot of steps, but trust me, it's super easy, not very messy, takes little or no artistic skill and easily passes my DIY Bullsh*t Test. Add room temp water to the dishpan to a depth of about 3 inches up the sides of the dishpan. Pour about 1/4 to 1/3 of a sample pot of Chalk Paint into the water. This dye process is experimental, so start by adding a small amount then stir well, then add a bit more to darken the dye mix, stir well again. Keep stirring to break up any paint globs along the bottom of the pan..
Submerge the cushion cover in the paint/water dye solution. Swish it around with the stir stick. If any paint globs get on the fabric, rub them in well to work the colour so it blends well. No worries about using your bare hands for this. Chalk Paint washes away easily with soap and water. Swish the fabric around and wring it as you wish to work the colour into the fibres. Hang to dry so that it drips over the dishpans. 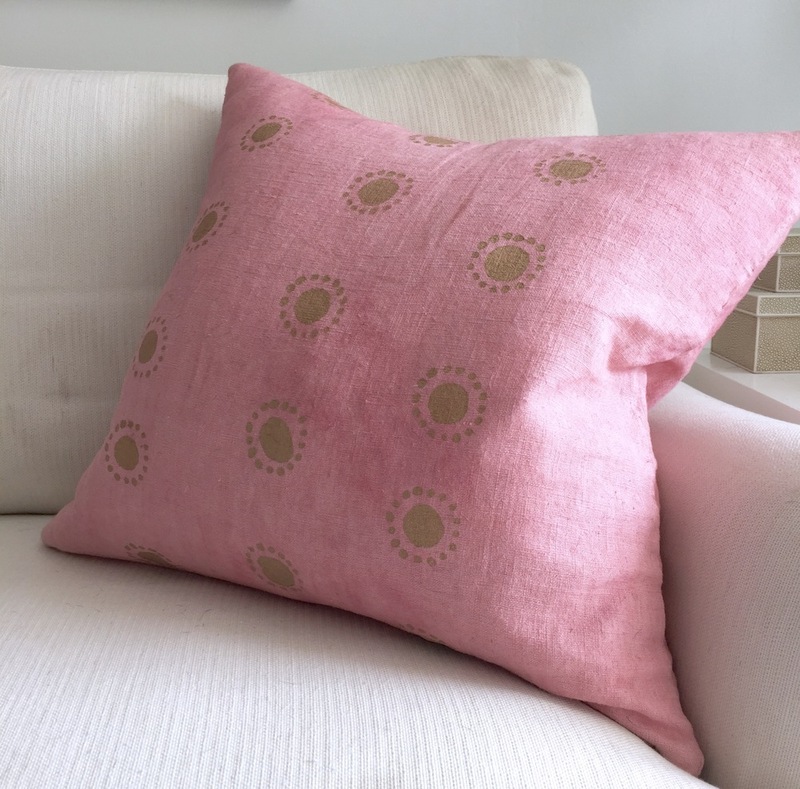 Once dry, dampen it a bit again with a few splashes of water, then put cushion cover in the dryer to fully dry and set the colour. Above is how my cushion cover looked after this initial dying process. The colour ended up being a pinky-red that looks as if it has faded over time. I love the vintage look. Inspired by the hits of gold I had seen in Frankfurt (and because my Marilyn Denis Show segment was to be about gold projects), I kicked things up a notch with the addition of some gold stencilling. One of the most challenging aspects if DIY for me is knowing how much is too much — when to stop. I decided before beginning that I would keep this treatment understated and just do three rows of the dots. Place a kitchen garbage bag or other plastic inside cushion cover so that fabric paint won’t bleed through. Hold stencil in place. Dip brush in paint. Blot off some of paint. Repeat these steps to complete row of stencil. For next row, positon stencil so the dots in row 2 are lined up with the spaces between dots in row 1. Apply paint to stencil as described above. Repeat for third row, again positioning stencil so dot in row 3 are lined up with spaces between dots of row 2. 8. Once paint is dry, use iron to set colour according to paint packaging instructions. 9. Stuff with cushion filler, style, photograph, enjoy!